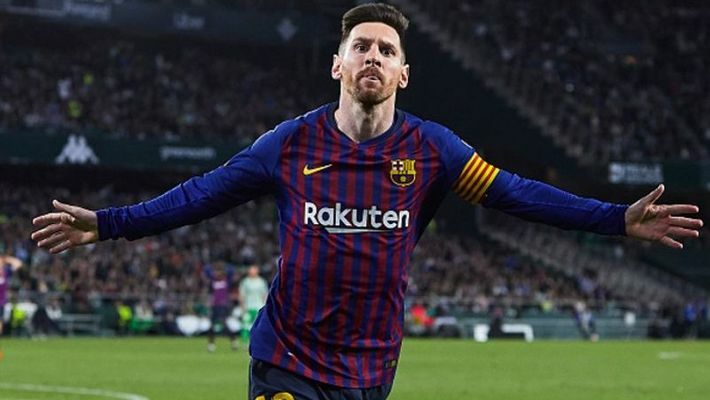 With the opposition Real Betis appreciating his efforts, Lionel Messi expressed his gratitude towards them and said, "I don’t remember the opposition cheering me for a goal, I am very grateful." Former England international Gary Linekar called Messi's hat-trick goal as "absurd"
Seville: Argentine superstar Lionel Messi produced another brilliant hat-trick to pilot Barcelona to a 4-1 victory over Real Betis on Sunday in Seville. Messi's incredible treble pushed Barcelona closer to the La Liga title as they moved 10 points clear of Atletico Madrid with 10 more games remaining. This was Messi's second hat-trick in a month in Seville and overall 51st of his illustrious career. Even the rival Real Betis fans doffed their hats to Messi's skills. With the opposition appreciating his efforts, Messi expressed his gratitude towards them and said, "I don’t remember the opposition cheering me for a goal, I am very grateful." Former England international Gary Linekar called Messi's hat-trick goal as "absurd". "The hattrick goal is absurd. There are great players, all-time great players, and then there is Messi," he wrote on his Twitter page.